Allo, Google's latest instant messaging app, may not be the most used app in the World right now. But the Mountain View company seems to be heading in the right direction, in promoting Allo. A desktop browser version of Allo, is in the works, according to Nick Fox, Google's VP of communications. This is something Google should have done when it first launched Allo. 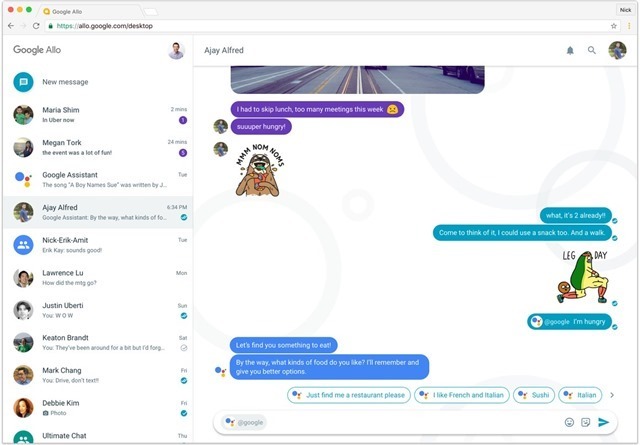 Mr. Fox posted a screenshot of Allo on the web, being used on Google Chrome, on a Mac. It would have been better if Google releases a proper Allo desktop client, which can be used without opening the browser. Most IM services do offer one. WhatsApp has a desktop application, though it is more of a wrapper of the WhatsApp Web version, and it is restricted to Windows 8 and above). Viber has a good desktop application too. But Telegram has the best desktop version, which is also available in a portable version, and a web version usable from browsers. Telegram is also the only one of the lot, which supports true multi-device usage. But Allo's main rival, is Facebook Messenger, which has a web browser version, and a separate mobile app. So, it comes to us as no surprise why Google is following it down the same road. It wants to dethrone Messenger from the top spot, but we think Allo still has a long way to go. Allo for Web is live for Android users. But it only works on Chrome browsers.